Eat like a Pharaoh! I don’t care how you spell it (Molokhia, Molokheya, Mulukhiya) or what you call it (Jews Mallow, Jute Mallow, Mallow Leaves) because regardless of the name, this is one of my favorite comfort foods. It is a traditional Egyptian soup that was typically eaten by royalty in Ancient Egypt, but eventually became a very common food. When I was a teenager, my mother knew that there were two easy ways to get me out of bed once He-Man cartoons lost their allure. She would cook something that included sauteed onions or sauteed garlic. Within a few minutes as the smell permeated the house, I was up and floating towards the kitchen like a cartoon character led by his nose to follow the sentient scent of food. 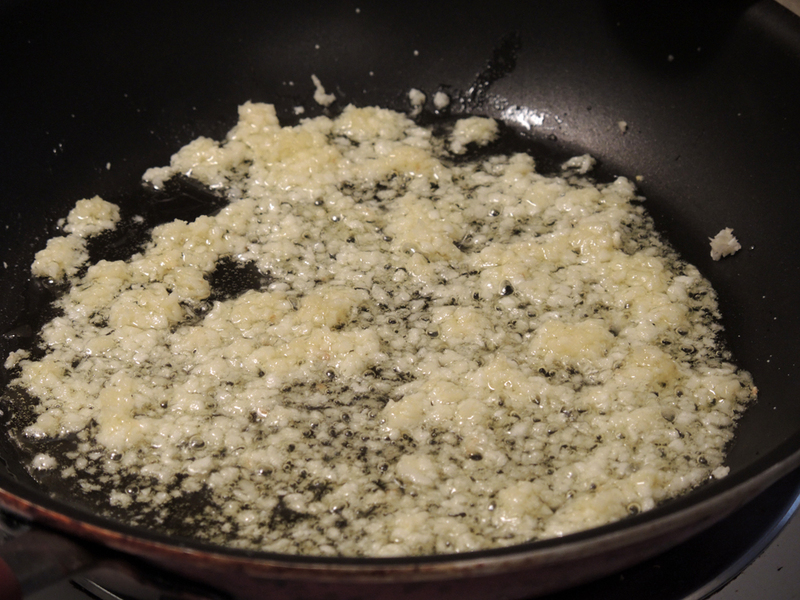 When I got to the kitchen and saw the sauteed garlic, it was usually going into a pot of Molokhia. It is a low calorie food prepared using finely minced leaves of the Molokhia plant, which are then mixed with a broth, topped with sauteed garlic, and often served over rice or pieces of pita bread. Common pairings include roasted chicken, seafood, and roasted/fried rabbit! I think rabbit goes wonderfully with this soup. As a child, my brother always liked it best when our mother would tear up small pieces of chicken and put it in his Molokhia. Children often eat it this way even though that was never my preference. Most people seem to agree that the taste of the soup is delicious, but where people differ is in their opinions on the texture. The Molokhia leaves, while packed with vitamins and nutrients as most green leafy vegetables are, tend to have a viscosity that some people don’t find appealing. It is often compared to okra in this regard, but I think okra is much more slimy than Molokhia. Growing up with this soup, I don’t see the texture as a problem at all, so the delicious taste is all I really care about. At some point when I was in law school, I asked my mother how to really make Molokhia properly because to my surprise, I’ve had some really bad preparations over the years. I might be biased, but I’m convinced that my mother’s recipe is the best (along with her stuffed grape leaves, but that’s a different post!). When she told me how to make it, I was very surprised at how simple it was. I then realized that the reason the other preparations I’d had were so bad was that they were overly complicating the recipe with unnecessary, even detrimental, ingredients. As you read the recipe below, the most important thing I can tell you is: KEEP IT SIMPLE. If you research Molokhia online, you will find recipes that include coriander, cardamom, bay leaves, and even mastik. DO NOT, I repeat, do not do this, no matter how enticing you might find those ingredients. Please. I’ve had versions that I found truly inedible. My personal feeling is that the second you complicate this recipe, is the second you ruin the wonderful flavors. Lastly, don’t worry about frozen vs. fresh Molokhia. I know people love fresh food, but we just don’t have much fresh Molokhia in America. My family used to grow some in the summer, but it takes a lot of leaves to make one pot, so it wasn’t really worth the effort. The alternative is frozen Molokhia, which is actually very good, so go to your local Middle Eastern store and grab a couple of packages. The rest of the ingredients are things you would normally have lying around. Makes one pot with about 400 calories and about 4 large or 6 smaller servings of 100 – 67 calories each. + optional: 1 cup of cooked white rice at about 205 cal. + optional: half a loaf of large pita bread at about 160 cal. 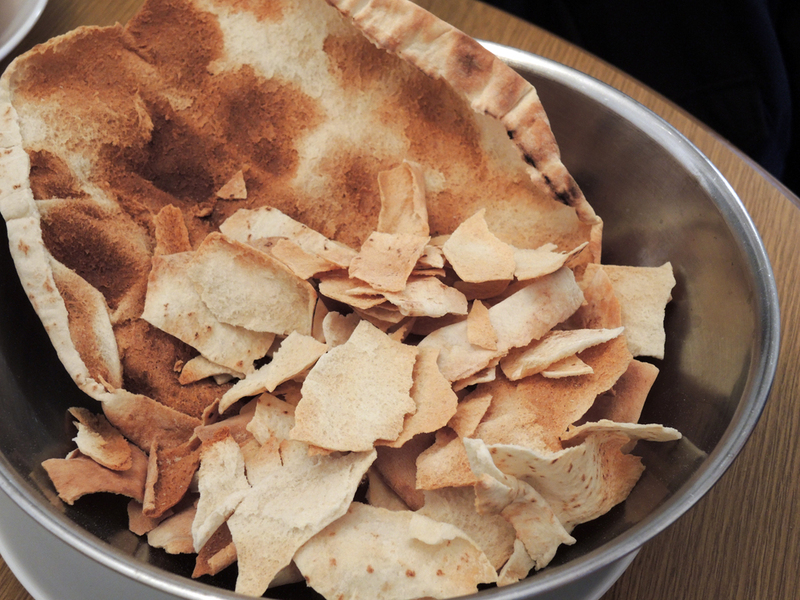 Molokhia served over crispy pita bread. 2 frozen packages (or 800 grams) of diced Molokhia (about 240 calories total) Note: Molokhia also comes as whole leaves (even if frozen). You do not want this unless you are making a different kind of preparation such as a Lebanese or Vietnamese version. 4 cups of chicken broth / chicken flavored vegetable broth / equivalent chicken bullion cubes (about 20 cal.) Note: You can also use beef broth, but only if the beef broth is light and freshly made. I wouldn’t recommend canned beef broth. A pinch of fresh ground black pepper. Bring 4 cups of broth to a boil. 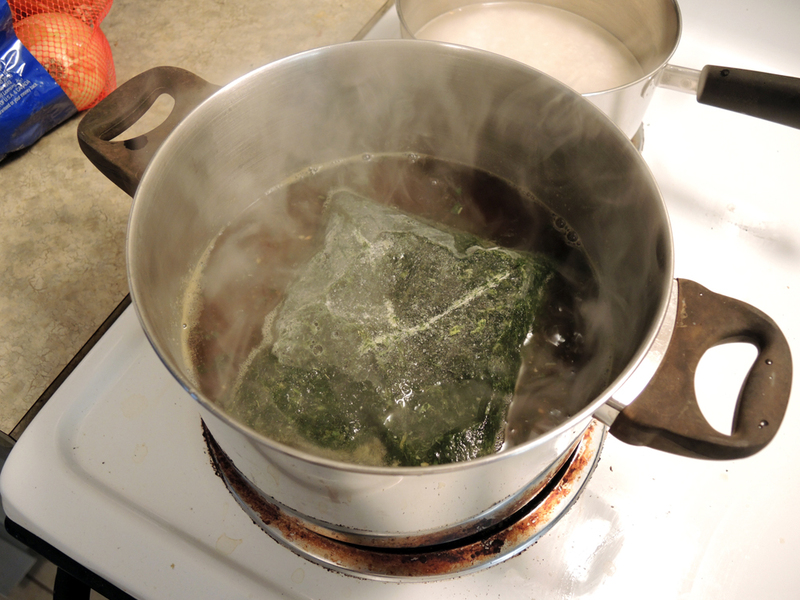 Open up your packages of Molokhia leaves as soon as your broth is about to boil. Do not thaw the leaves ahead of time. That “X” shape isn’t anything special. It’s just how my mother used to open the package quickly with a knife and it’s fun, so I do it too. 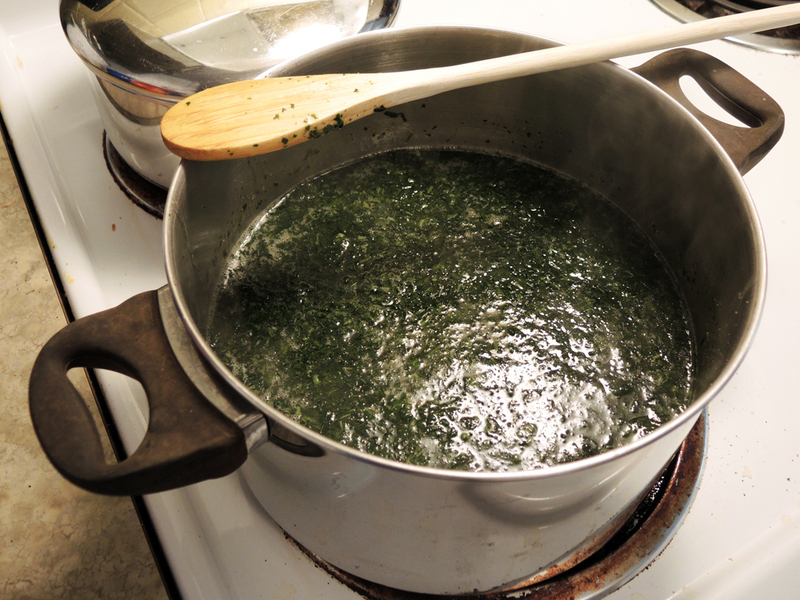 Carefully drop each package of frozen molokhia into the boiling broth. Bring the broth back up to a mild boil and then just let it simmer. You do not want to boil this soup very hard. A low simmer is perfect. Stir the molokhia every once in a while to really get the molokhia melted (only about 15-20 minutes). 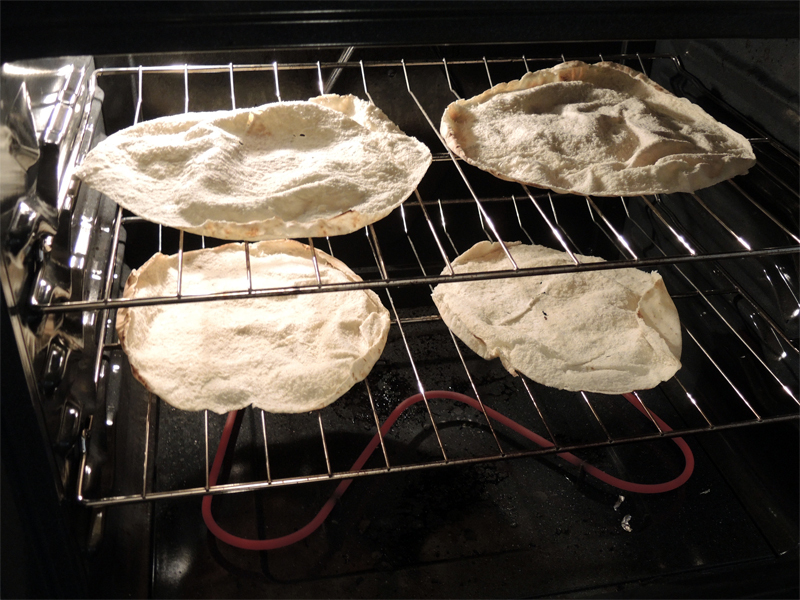 While that is cooking, make your white rice and/or toast some pita bread in the oven. Set the oven to 325 degrees and place the bread inside right on the rack. After a few minutes take out the bread when it has a nice golden brown color to it. Watch it closely because it can go from perfect to flat out burned in seconds. Carefully remove the bread from the racks and let them cool. If you’re not careful, the bread can shatter in your oven and that’s just a huge pain. Once the bread has cooled, crumble each large piece into small bite-sized pieces. 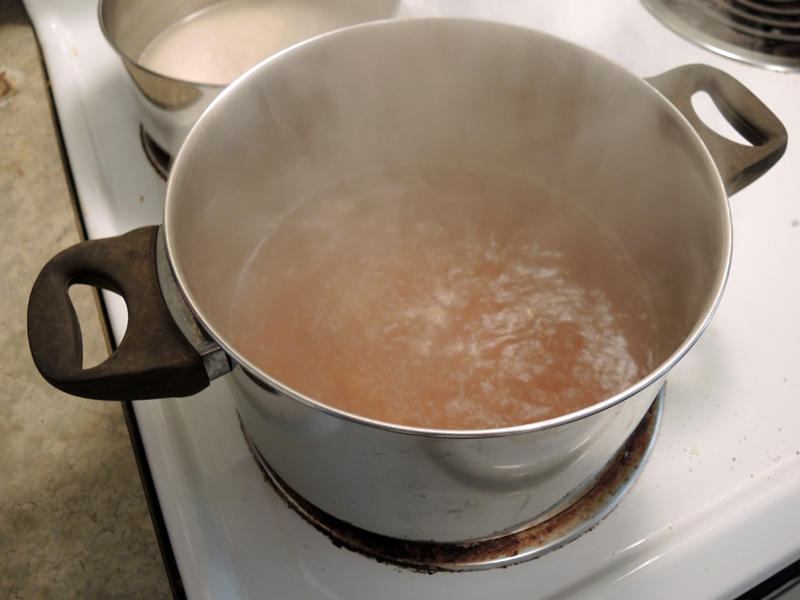 As soon as the molokhia is all melted, let the pot simmer (not boil) for about 5 minutes and then turn off the heat. 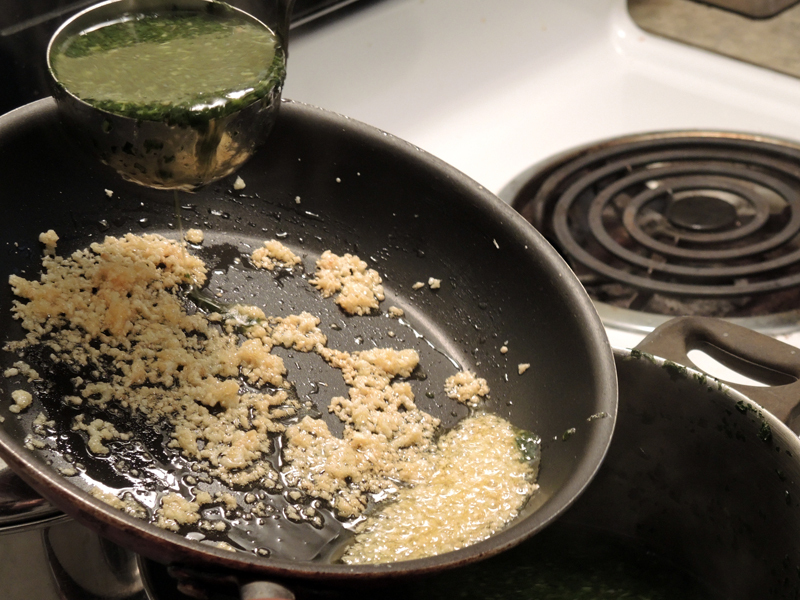 In a small saute pan, heat up a tablespoon of vegetable or olive oil on medium heat. Add in 6 crushed cloves of garlic (8 if you really like it garlicky) and saute while stirring frequently until golden brown. Be careful not to burn the garlic! At this point add in the pinch of crushed black pepper to the garlic and saute together. Once the garlic is ready, bring the pan over the pot with the Molokhia in it and then ladle some of the Molokhia over the garlic. If you get a satisfying sizzle noise then you’re doing it right. Repeat this step so that all of the garlic in the pan is now in the pot. I’m not sure why this is done except that this is how it is done at my house. 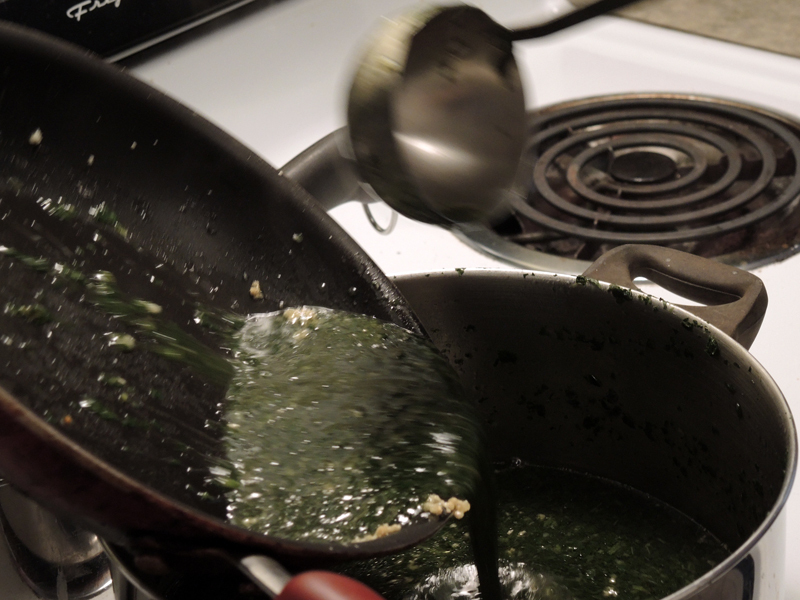 It’s an easy way to get the garlic out of the pan and mix the soup at the same time. That’s it. Molokhia is ready to be served on its own, or over some rice and/or some toasted pita bread. Add salt to taste. If you happened to use chicken flavored bouillon cubes, then it might already be salty enough. If you just used chicken or beef broth then you will definitely need salt. At my house, we each add however much salt we want to our own bowl because we all have different tastes. Serve the Molokhia alongside fried/roasted rabbit, chicken, seafood, or a spinach pie! If you enjoyed this recipe, please support the blog by subscribing to receive the latest posts. Copyright © 2013 Home Is A Kitchen. All Rights Reserved. The content on this page is owned and written by Home Is A Kitchen (www.homeisakitchen.com). Duplication or use of this content without permission is prohibited. The presence of this content on any other site is a violation of this Copyright. For permission requests to use some or all of this content, use the contact form in the “About” section. Great story and an interesting recipe. I’ve never heard of this before. I’ll have to check it out. Glad you enjoyed the post. It doesn’t get much more traditional than this dish. If you do ever give it a try, I’d love to hear your thoughts! You forgot a very important ingredient essential to this recipe and it is the coriander. You can buy it frozen and add according to your taste or crush whole coriander seeds and sauté with your onions then add it to your molokhia .it makes all the difference! Thanks, Anonymous for your comment about the coriander. I did not forget actually, but intentionally left it out. Yes, there are some people that eat it this way, but I am not one of them. I actually mention in this post that I do not think you should add coriander. I think Molokhia is the best when you keep it simple. Adding coriander just makes the Molokhia taste like a very similar dish made with pureed okra instead of the Molokhia leaves, which is good, but completely separate in my mind. Absolutely, Ria! Thanks for stopping by and sharing. Can you squeeze a lemon over this veggie? Does anyone do this? Hi Xenia, thanks for your question and for stopping by! I don’t squeeze lemons over molokhia, but some preparations using whole leaves might. Some people like adding onions marinated in vinegar to their molokhia, but I don’t. You could add lemon if you wanted to try it out, but it’s just not something I do personally. Middle eastern food is so yummy… but I too have never heard of this. If I come across Molokhia, i’ll definitely pick some up now! You don’t think this is a typical Egyptian recipe? Why not? This is as classic as it gets as far as I’m concerned. It’s the most basic, but also most delicious form. I have never seen Molokhia and now, I live in a culturally bland area.I will have to look for it, whe we go out of town… when we travel “far and wide in search of spices” [my husband, doing his Marco Polo impression]. My idea is that the ladling of the Molokhia over the garlic would have the flavors mix quickly and the garlic and its flavor would be more evenly spread throughout…at least, that is my theory. My mother had a number of little tricks like that, and they can make all the difference in the texture and flavor,(surprisingly so). So keep doing it! It obviously works! I’m glad I could show you something new! I’ll be sure to keep cooking with all of the little tricks passed down to me. The garlic thing is what we do in India- the method is called ‘Tarkha’ hence you get tarkha dhal. So you can fry some onions with or without cumin, whole chilli and mustard seeds; or do the same with garlic and put it on the dhal or any other preparation. You can also do this on yoghurt with some curry leaves. Gives it a nice flavour. Glad you like the recipe and that it reminded you of your own family. You’re right about the onion when it comes to making broth from scratch. It’s a great way to flavor the broth and remove some of the gaminess that sometimes can occur when making broth from scratch. Let me know how your molokhia turns out! That is devotion! As one who considers this a comfort food, I can understand your persistence in cultivating your own molokhia. When I was very young, my family used to grow molokhia in our backyard in the summer. Unfortunately, the summer was so short that we only cultivated enough for one or two pots. Please keep up the good work and thanks for stopping by the blog! Just discovered your site. Thank you for sharing your “Molo” recipe! 🙂 I first discovered it as my late and Ex, mother in law (originally from Egypt) was an incredible cook, and she used to make it. And OMG just thinking about it makes me salivate!! I used to be eat several bowls at one sitting. It was a truly unbelievable experience …… the continuous ooooh’s and ahhhhh’s and praises of how utterly delicious it was, everyone seeming to become DRUNK! from consuming and sharing in the ecstasy of the absolutely amazing flavour of this very VERY special soup! I cannot describe the consistency …there is nothing like it. One day, I will make this “INCROYABLE” soup, and will let you know how it turns out. My grandmother was born in Egypt and after coming out to Australia she grew it in the backyard and would cook this mostly on Sundays for lunch. She would boil a whole chicken and use the chicken broth for the soup and then add the cut molokhia which was cut with a two handle curved blade which was brought with her from Egypt. Garlic and salt were added, but I don’t remember how or what else. But I do remember she would prepare rice using butter cooking it the absorption method on the stove. After the molokhia was ready it would be served in a bowl with a piece of chicken cut up, rice and a side plate of chopped onions in apple cider vinegar. A bit of each was put into the soup and that’s how we enjoyed it. I remember the vinegar and onion gave it a bit of a kick. It was delicious. I would enjoy several bowls of this at one sitting. I miss her and her cooking. Those are some great memories! I have never tried putting chopped, quick-pickled onions in Molokhia! That sounds like it could be good. I’ll be sure to give it a try! Thanks for sharing this great story about your grandmother and this food. That’s how my grandmother used to make it, too. Would chop the leaves with a curved two handled knife, boil it in broth where chicken was cooked. served it over rice with chicken pieces, crumbled toasted pita bread, and the final very important ingredient, onions in vinegar which gave the whole thing this amazing tanginess. I haven;’t eaten this in over 20 years and now have decided I must recreate this wonderful dish from my youth! Hi Ivano! I’m sorry you haven’t eaten this in 20 years. That’s way too long! Thanks for stopping by and I hope you find some molokhia soon! I tried your method of making molokhia omitting the coriander and to my amazement found that you are right. The delicate taste of molokhia shined through in a very appealing way. That’s great! So glad you tried it this way and enjoyed it! I, an American, married to a Jordanian, started making this about a year and a half ago. We make it a bit different though. My husband’s family make it with a tiny bit of spinach, chicken “fried” golden just before garlic is sautéed & add tomato sauce to the broth. It’s really good & I’ve gotten pretty good at making it. Honestly, before I was taught, I did my own research & found your method. It helped me feel better about attempting to cook it. We serve with jasmine rice & my husband squeezes a bit of fresh lemon juice into his. I like it with lemon juice sometimes, but prefer it as is. Hello Yasiji Ann. That method sounds very interesting. It is definitely very different from anything I have seen before. I have never heard of adding tomato sauce or spinach to molokhia before. Thanks for sharing this different approach. I haven’t had this in over a decade and when I did it was in an Egyptian family home. I believe they had a simple recipe also. I’ve recently switched to a vegetarian diet. Do you think a vegetable broth could produce a satisfying soup? My pleasure, Ilema! You could make this using a real vegetable broth, but it will taste a little different. My advice is to find a vegetable broth or bouillon cubes that are vegetable based, but that also say “Chicken Flavored.” These types of chicken flavored vegetarian/vegan broths will produce a better result. I used to use vegetarian chicken flavored bouillon cubes frequently myself and they didn’t have any chicken in them (mostly just onion and other spices). I hope that helps! Hi, Grace. I don’t have a recipe for machboos, but there seem to be plenty on the internet. I’ve never made that dish before or even tried it. Is that an Indian dish? My Indian cooking experience is limited and mostly consists of dishes found in Indian-American restaurants. If I ever take a crack at machboos, I will let you know. Thank you for this yummy simple recipe 🙂 My Egyptian husband was very happy and even our 6 month baby had a good helping. Happy cooking! Hi Erika! I’ll be honest that I never tried dried molokhia. The dried variety is usually used in Lebanese cooking to make whole leaf dishes. 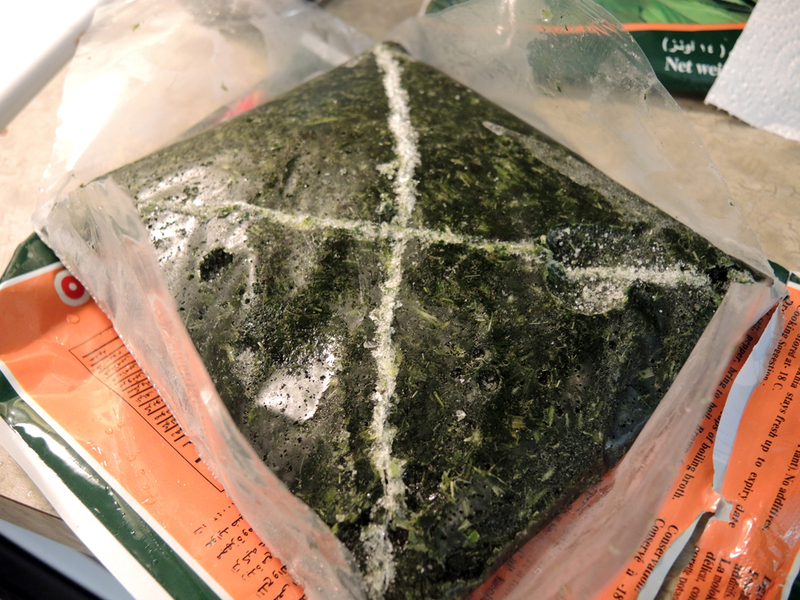 The frozen kind is pretty slimy as well, but it probably tastes better than the dried stuff because it is fresh leaves that are chopped and frozen with their natural moisture. The frozen molokhia most closely approximates what it would be like if you diced fresh leaves. If I were you, I would dice or crush the dried molokhia leaves until they are tiny flakes. Then try following this recipe by adding the dried molokhia to the broth. You may need to cook slightly longer to rehydrate the leaves a bit. That’s my best guess. I hope it works for you! I frequently travel to Egypt and absolutely love molokhia! I brought home a couple bags of the chopped (dried) vegetable they use and my friends insisted all I should do is add it to chicken stock with a little onion and garlic, maybe some salt and pepper. You know how the conversation goes when you ask a good cook for the recipe – “Oh it’s easy! A little bit of this, a little bit of that …” I was skeptical, so I searched online and found your recipe which is very close to what they described. I’m going to try it exactly as you instruct. And since it’s dried, rather than fresh or frozen, I will let you know how it comes out. Hello, Lucie! Thanks for stopping by. I will tell you right now that the dried molokhia may not come out as you would hope. 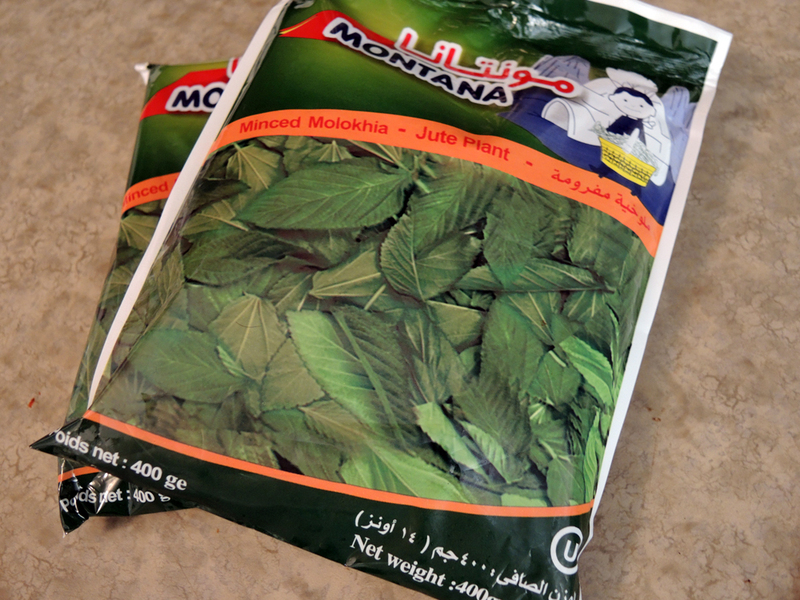 Dried molokhia is usually used to make a Lebanese version of the dish that keeps the leaves whole. 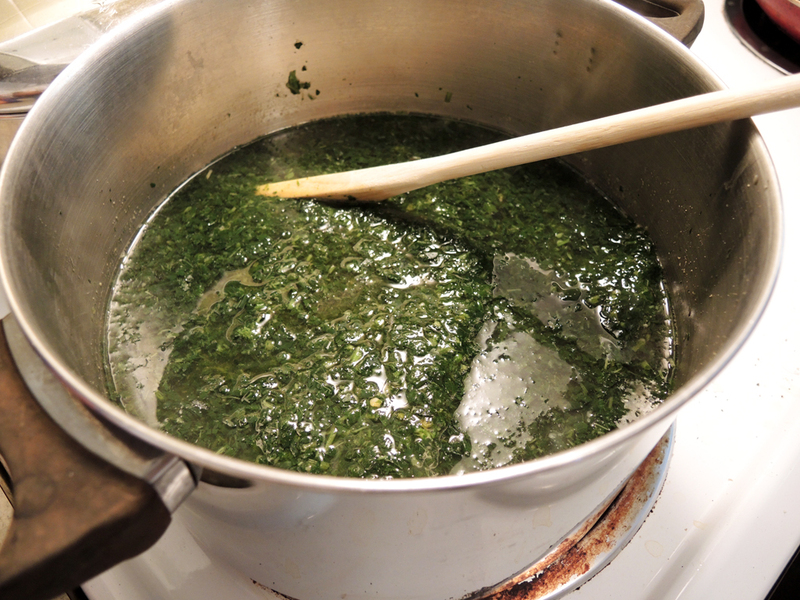 If you want to make it Egyptian style, the leaves will need to be very finely diced. There are a couple of ways to do this, but your best bet may be to grind the dry leaves in a food processor, so that they become very fine. Then try and approximate the recipe as best you can after that. Good luck! I just found this recipe and your blog. Thank you. I was introduced, by my beautiful and adorable Egyptian mother in law,, to a whole array of exotic foods that my Irish palette had never encountered, Okra, Kosheri, Molokai ……. I still remember looking at the bowl of Molokai on the dining table for the first time and thinking there is NO way I can ever eat THAT. However it immediately became my all time favourite Egyptian dish of my mother in law, She is an amazing cook, and her grandkids all definitely have the Egyptian taste buds, they go crazy for her Molokhia and their Teta’s vine leaves, Kibbeh, Peas & Carrots. Tragically, in the past 12 months, her memory is fading and she cannot remember most of her wonderful recipes anymore. Some of her recipes I had written down, but Molokhia, as easy as it is, was one I was unable to totally get right. Most of the recipes I found online didn’t fit the bill, your one does !! It is the typical family Egyptian recipe (although my father in says my mother in law added Coriander powder) and I have a pot of it on the stove now as I write (although it is looking a little bit too liquidy at the moment so I think next time I need to use less stock. PS do you have a Kosheri recipe ?? Hi Caro! I’m very happy that you are enjoying this recipe. The potential loss of family recipes is exactly one main reason I started this blog. I wanted to write everything down that I learned from my mother and that I’ve learned on my own. That way I can not only share it with others, but keep the recipes alive for my own family. Regarding the thickness of the soup, this recipe does make a soup that is not too thick and not too watery. Some people prefer it more watery while others prefer it much thicker (I’ve had molokhia that was almost like pudding before!). Simply reducing the amount of broth would give you a thicker soup. As far as koshari goes, I am working on a recipe, so please check back in and I will post it when it is ready! Enjoy! I was born in Egypt and my family left when I was 9yrs old. But, memories of molokhia are alive and well. My mother was a super duper cook. Everything she made tasted amazing. I just bought some dried molokhia from Amazon. I’m going to try your recipe. I like it with rice and chicken breast pieces. That’s wonderful, but like I’ve told so many other people, please be careful using the dried molokhia. It really isn’t the same as fresh or frozen. You will need to probably put it in a food processor or blender to really crush the dried leaves. Then add them to the boiling broth. I have no idea how good it will turn out using dried leaves, but I wish you luck! Sorry to hear that, but I suspected the dried leaves wouldn’t really work as well. I think you would also need a ton of dried leaves to make it work. The amount of leaves in a frozen package is quite large. At least you tried it though! I love this recipe it tastes sooooo good don’t you guys think so? I would definitely not use the dried leaves. It is not the same as the frozen one. I put lots of coriander in my molokhia. I am planning on making a big pot and inviting all my cousins so we can eat and remember what an amazing molokhia my Nona used to make. I wonder if it’s better without the coriander. I will have to try it one day. A family gathering around molokhia sounds great! I agree that the dried is definitely not the way to go. As for the coriander, it’s just a preference. If you grew up having it one way, that is probably the way you will prefer. For me, I enjoy the simple taste of the molokhia with only garlic and a little black pepper. It lets the molokhia shine. We always used to put coriander in our okra, so that’s what it reminds me of. I did do my on line research and not only was this recipe persuasive. The recipe was fantastic. I used vegetable stock cubes but everything else the same. The finishing touch with the garlic is what made the dish for me. I’ll probably have a couple packages in the freezer at all times from now on. That’s so great, JH! The garlic is definitely the key! 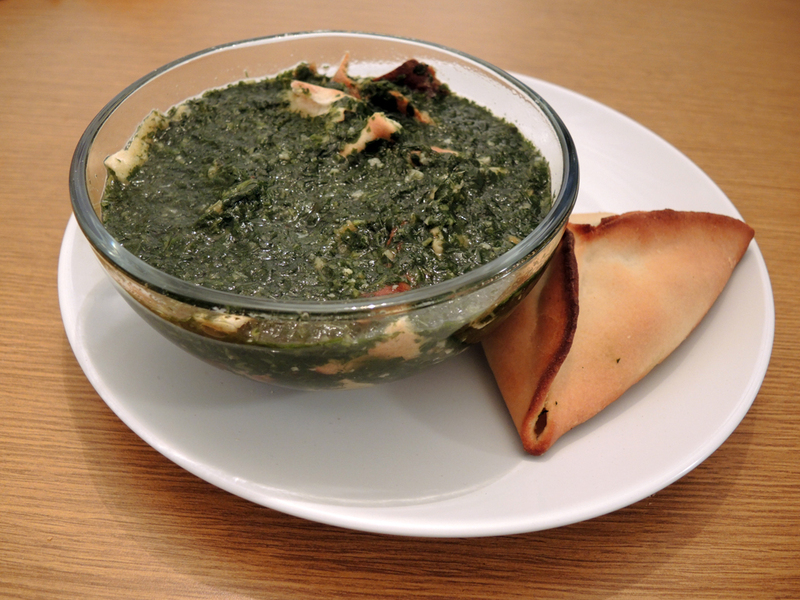 Do you have anymore egyptian recipes besides this and the stuffed grape leaves? Your recipes are very similar to some family recipes (and I absolutely agree with keeping this one simple! ), but unfortunately many of the family recipes were lost. If you have any other recipes you have shared I would appreciate the link! All the ingredients with coriander etc. are the right way to make molokhia. In addition, Egyptians do not put bread in molokhia, you can dip it but not mix it in. Thank you. Hi Maya. Thank you for stopping by and sharing your opinion even if I completely disagree. So pleased to see you were still responding just last month! I lived in Beirut for nearly 20 years with my then wife – mostly during the war – and enjoyed so many Sunday lunches prepared by Tante Blanche up overlooking the Bay of Jounieh – and you needed a REALLY good reason not be there! The dish was Lebanese style so with chicken and maybe lamb – which is the way I do it still some 40 years later, because after all you really do need to boil up chicken to make a decent broth. But I liked your enthusiasm and insistence on simplicity so I tried it your way, cut out the frills, and included the trick with the garlic. Of course it was really delicious too! Hi Harvey! So glad you enjoyed this version of such a classic staple in Middle Eastern cuisine! Of course the Lebanese preparation using whole molokhia leaves instead of diced is very different, but obviously good as well. I appreciate some tasty lamb and chicken with my molokhia as well! The whole leaves preparation is a Levantine thing, not just Lebanese. Although, some people do minced their molokhiyah Egyptian style. I’ve always preferred whole leaves because I like to chew stuff (lol), but I am willing to try the minced version again and see how that goes. I also use both dry and frozen molokhiyah (not at same time). Since I plan to lose some weight, I am going to make the Egyptian style tomorrow without any meat and rice. I feel it will be more fulfilling than whole leaves. Can’t wait! This recipe looks great and I’ve been itching to try it, but I can only find packages of whole molokhia leaves around me. Can I still use these, or does the molokhia need to be minced in order for the recipe to come out correctly? If I thaw the leaves and mince them myself, would that work? Molokhiyah can be prepared in two ways. Some prefer Egyptian style, others prefer Levantine style which is with whole leaves. You’ll just have to chop it up yourself if you can’t find minced one.